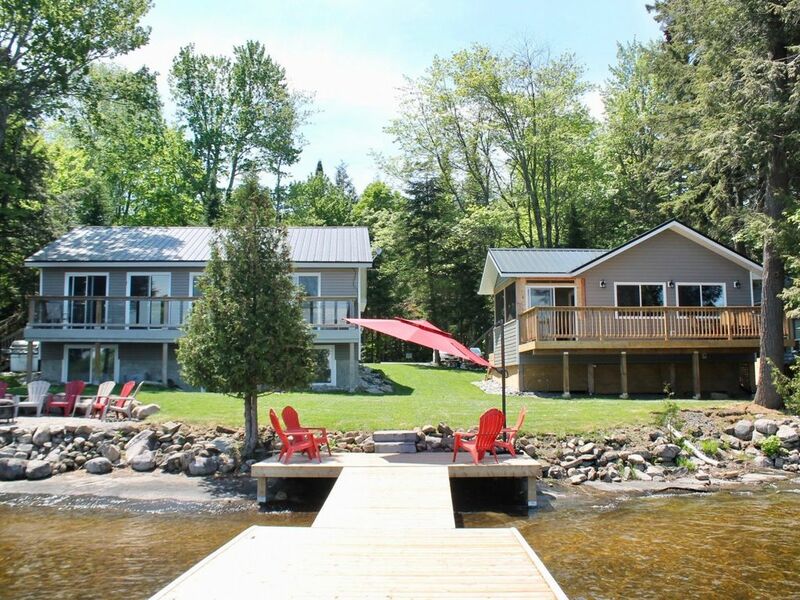 Multi-Cottage compound, great for large groups, and multi or extended family vacations. Two recently, renovated and newly constructed cottages on the shores of Lake Muskoka. 7 Bedrooms, 3 full baths, 2 kitchens and 13 beds sleeps 18 very comfortably. Both cottages are freshly painted, with brand new furniture, kitchen supplies and equipment and linens. Relax, eat and enjoy in multiple living areas, indoor and outdoor eating areas, and plenty of green space outdoors, when you are not swimming off the dock or enjoying a fire along the shore. Located near both Bala and Port Carling, there is plenty of selection of shops, grocery stores, gas stations, restaurants and things to do within a 5 to 10 minute drive. 5 minute drive from Bala, Ontario, 10 minute drive from Port Carling.